Регулируемый уровень температуры для великолепных результатов. Когда установленное время закончилось и еда готова, устройство автоматически выключается, оповещая это конечным сигналом. When you are throwing a big party or planning a dinner for a bigger number of people you can include serving home-made frites, onion rings, chicken nuggets or coated vegetables. The AD4906 deep fryer that has a capacity of 2.5l is perfect when preparing such deep-fried meals or additives for a number of people. 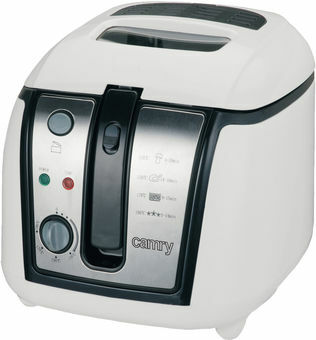 Thanks to CR4907 deep fryer you can fry your frites, onion rings, vegetables or meat easily at home: the device is equipped with a filter in the lid and a lit opening button. You will not burn the food thanks to the regulated thermostat. You can drip the surplus of fat thanks to the basked with lifting function that has a folding handle. The device is also easy to clean since it is equipped with a removable oil container.